Tuesday, August 7 at 5 p.m. Tristate players (active or inactive) over the age of 40 are invited to participate. Registration Begins at 5 pm. Players are requested to wear the uniforms they wore during their playing days (if they still fit). Each participant will receive an official Schweizer Fest hat. Trophies will be awarded for the longest hit ball, best defensive play and oldest participant. The game will be held at Frank Clemens Field at Walter Hagedorn Park. Contact Kelly Malone at 812-483-3381. ​Sponsored by Golden Living Center-Lincoln Hills. Friday August 10 at 9 a.m. (incoming 7th and 8th grade) & Saturday, August 11 at 9 a.m. (High School and adults) This double elimination tournament will be held in the Bryan Taylor Sports Arena at Tell City Jr.-Sr. High School. Registration and check in will take place from 8 - 8:45. Teams can have a maximum of four players. Entry fee is $10 per player. First place team will receive championship T-shirts. (Incoming 7th- and 8th Grade) Registration form is available on the Schweizer Fest website. Contact John Hayes with questions at john.hayes@tellcity.k12.in.us or at 812-719-0882. ​Friday August 10 at 5 p.m.
Saturday August 11th at 8 a.m. Six-mile race begins at 8 a.m. and two-mile race begins at 8:05 a.m. Kid’s fun run begins at 9:20. The race starts on 7th Street and ends on Main Street. The course winds through the streets of downtown Tell City before heading through some challenging hills for the 6-mile participants. 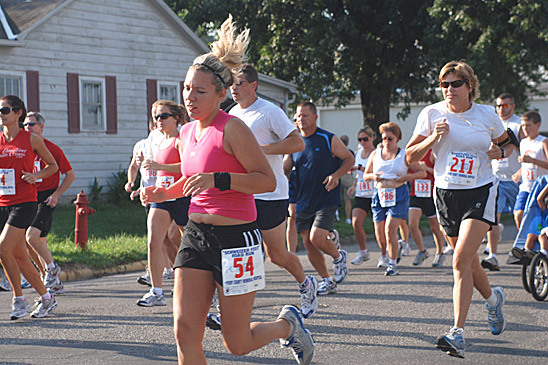 Participants must complete an official entry form before 7:30 a.m. the day of the race. Award ceremony takes place on Musik Halle stage after the race. Entry fee is $20 per person if received on or before Aug. 4th or $15 per person Family Rate (when signing up 3 or more at one time). Late entries will be $25 after Aug. 4th. Make checks payable to: Tell City Cross Country Boosters. Contact Chris Hollinden at 812-719-3644 or visit www.runperrycounty.com. Proceeds benefit the Tell City Track & Cross Country Teams. Silver Sponsors are ARI, Oakwood and Complete Wellness. Sponsored by Perry County Memorial Hospital. Silver Sponsors are ARI, Oakwood and Complete Wellness. Saturday August 11th at 10 a.m. Test your strength in this competition that's been hosted by EverBody's Fun & Fitness Center for nearly 20 years! Weigh-in begins at 9am. Competition starts at 10am. 11 divisions- 8 for men, 2 for women, and a Masters. Entry fee is $20 by August 4th or $25 after. All participants will receive a shirt and awards will be given to 1st place winner of each division. To enter contact EverBody's (812-547-3565) or email breanne@everbodys.com with any questions. Contact Zac Hartz at 812-547-8630 for information. Saturday August 11th at 1 p.m. The event will take place on the South end of the Beer Garden. Sign-in from 12-12:40 p.m. No early entries will be accepted. The tournament is limited to 64 teams. Both team members MUST be present at sign up. Bring your own partner, all ages are welcome. Entry fee is $20 per team. Best of three in each round. First place wins $500! Proceeds benefit the Tell City Track & Cross Country Teams. Sunday August 12th at 8:00 a.m. - Bike Perry County, along with some amazing sponsors, is hosting the 7th Annual Bicycle Tour on Sunday, August 12th. Choose from a 6-mile family route that mimics the 6-mile road run, a 31-mile intermediate route, and a 62-mile advanced route. Register early to get the early bird special of $20 and a free T-shirt. Early Registration Deadline is 8/4/18. Price increases to $25.00 on 8/5/18 and shirts may be very limited. Register early to secure your shirt and save $$. All routes begin and end at EverBody’s Fitness located at 710 Fulton Street with a mass start at 8:00 am. Packet pickup and Day of Registration is from 7:00 -7:30 Sunday morning at Everybody’s Fitness. SAG Support and rest stops on both the 31 and 62 mile routes. Routes are marked with Dan Henry marks. Safety is very important to us, so helmets are required. Please observe all traffic laws. Riders should be prepared to handle their own bike maintenance if needed. All proceeds from the bike ride will go to the St. Paul’s Mission Trip.